A couple of years ago I was having a conversation with a friend of mine, Alicia (a.k.a. Harley from the Sarcastic Gamer Pink podcast). She was talking about trying to add some sort of video segments to the SG site to help generate traffic. Right about that time, I'd had an idea about writing an article for a food or gaming magazine with some fun quick recipes for gamers to make. Since Alicia is a chef/caterer, I suggested that to her as a possible series of videos. She liked the idea and wanted to run with it. Occasionally, it would get close to being filmed, but unfortunately circumstances kept creeping up and the idea ended up getting mothballed. Now we fast forward to a few months ago. If you know me, odds are pretty good that you also know I love to cook. Mind you, cooking is usually something I do for fun, and I've had no sort of "training" whatsoever. Well, every once in a while, I'd revisit the idea of doing something to combine my love of cooking with my work in video games. Eventually, the idea evolved into something more interesting, more fun, and admittedly, more challenging. Instead of putting together some quick Game Night finger food recipes, I started thinking about putting together cool and unique recipes INSPIRED by specific video games. I'm not talking about taking some sugar cookie, cutting a triangle slice out of it, and saying "Ta-da!! It's Pac-Man!!". Instead, I want this food to be a little more intricate, like you might get at a restaurant, but still keeping things simple enough to make at home without a lot of complex preparations. 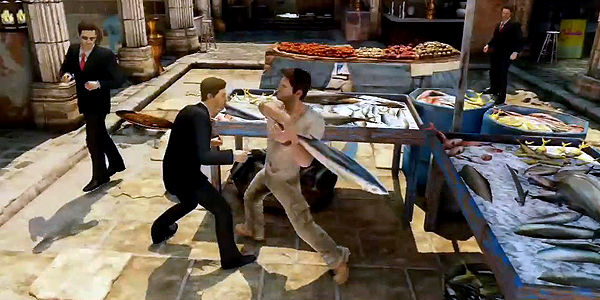 For example, if you're a fan of Naughty Dog's Uncharted 3: Drake's Deception, you probably remember the scene at the left. While in Yemen and tracking down the lost city, Iram of the Pillars, Drake gets ambushed by goons in a street market and can defend himself with a handy fish (earning the player the "He's Gonna Need A Sturgeon" trophy in the process). It's a fun scene that strikes a chord with gamers and made for a perfect little bit of inspiration for a meal. In this case, my thought was a Middle Eastern dish called "Samak bi Tahini" ... basically fish in a tahini sauce. A little research and a couple of "test kitchens" later, and presto ... a tasty, easily replicated entree dish based on the exploits of Nathan Drake in Uncharted 3 was ready to go. Add a few little trivia bits and a possible developer comment or two and you've got a recipe for a fun new video game related project (yeah, I went the bad pun). If you want to try the recipe for yourself, just check in later ... it'll be one of the first to go up when the project goes live. Which leads me to the part where all of you come in. Talk to me ... tell me your thoughts on what you'd like to see. What games do you think deserve the culinary treatment? Would you like to see 'em one at a time via semi-regularly scheduled articles? Collected together at once in a book? (And yes, folks, I know I could do the articles and then collect them into the book.) Also, how many of you are willing to try out the recipes for yourselves? Heck, is this something you'd even see yourself checking out? I want your feedback.